Scan Pro – 5x more powerful than standard OBD-II devices and provides professional 24/7 vehicle scans for pre-emptive maintenance to increase safety and save money. VOYO with Scan Pro will help fleets decrease maintenance and fuel costs and increase performance and safety. 47% of the vehicles with codes had an average of 3.5 codes and a range of 1-15 codes. 19% of the codes were generic and located on the Engine Control Unit (ECU). 81% of the codes were advanced or located on a non ECU controller. 28% of the vehicles were in need of repair taking into account the type of code, status (active, pending, historical) and symptom number. 60% of the vehicles in need of repair had codes related to electro/mechanical problems, many impacting vehicle safety systems. 40% of the vehicles in need of repair had efficiency related codes and would fail emissions testing in the 14 states that are following the CARB emission standards. The fleet results exceeded the prevalence of codes previously reported by Voyomotive on non-fleet passenger vehicles which determined that 16% were in need of repair. Importantly, the fleet cohort had a median model year of 2015 compared to a 2010 median for non-fleet vehicles. Normally, it can be expected that newer vehicles have fewer problems than their older counterparts; however, the fleet vehicles drove an average of 42k miles per year versus 15k miles for non-fleet vehicles. The study shows that the number of miles driven per year is highly correlated with diagnostic code incidence and that the almost 3-fold increase in miles driven per year leads to a 75% increase in a service repair requirement. Standard OBD-II devices only detect generic codes located on the ECU and do not report important diagnostic parameters such as symptom data. 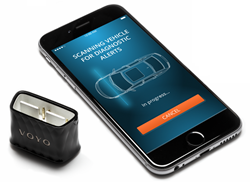 Scan Pro works in conjunction with the plug-in VOYO OBD-II controller to read manufacturer DTCs from all vehicle computers and reports both symptom data and code status. The Voyomotive study found that standard devices would only be able to report 19% of the codes found by Scan Pro due to the high incidence of advanced, manufacturer codes and their location on controllers other than the ECU. Significant cost and safety benefits are gained by diagnosing and addressing vehicle malfunctions at the earliest possible time. Until now, the inability of existing OBD-II devices to read advanced DTCs has forced fleets to rely on infrequent connections to scan tools at a garage. Now, VOYO with Scan Pro allows fleet owners to continuously perform a professional scan of all their vehicles so any issues can be addressed at the earliest possible time. Scan Pro currently works on over 150 million vehicles, including most major car brands manufactured since 2008 such as Toyota, GM, Ford, Honda, Fiat Chrysler, Nissan, Mazda, Hyundai, and Kia. Companies specializing in vehicle repair, parts distribution, and app development that would like to incorporate Scan Pro or other VOYO capabilities into their business applications are welcome to contact the Company directly at contact(at)voyomotive(dot)com. Headquartered in San Francisco, with a research and development facility in Ypsilanti, Michigan, Voyomotive is bringing the world’s most advanced connected car technology to market. In addition to its consumer product, VOYO, the Company offers the Passport controller which supports an embedded cellular modem to address the needs of the commercial market and fleets. To learn more about the ways Voyomotive technology increases vehicle safety, security and convenience, please visit http://www.voyomotive.com.